Liverpool booked their spot in the knockout stage of the Champions League on Tuesday night, but it reportedly came at a price with injuries. The Reds secured a narrow 1-0 win over Napoli to emerge from their group along with Paris Saint-Germain, after what was a tense and thrilling encounter between the two sides at Anfield. However, as noted by The Sun, both Joel Matip and Trent Alexander-Arnold came away from the clash with injury problems, as they suffered shoulder and foot issues respectively. 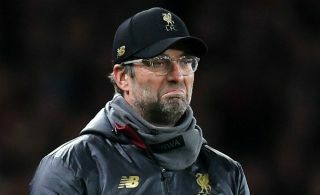 It’s suggested that both could now be doubts to face Man Utd this weekend, but with Jurgen Klopp unavailable to provide clear updates on the pair, it remains to be seen whether or not they get the all clear from the medical staff to feature and allay any fears of long-term issues. Given the busy festive period is fast approaching, the last thing that Liverpool need is to be struggling with injuries, especially as their impressive season continues. As well as advancing in the Champions League, they currently sit top of the Premier League table and so they’ll be desperate to avoid suffering too many setbacks in their bid to maintain their current form. Liverpool have already lost Joe Gomez for six weeks due to a leg injury, as per the club’s site, and so particularly in terms of this being two more defenders who have picked up problems, it’s a concern for Klopp until further tests and scans are done to rule out any long-term issues. Being left light in such a crucial department will be far from ideal, but it remains to be seen if the Reds boss receives positive updates ahead of facing United at Anfield on Sunday evening.